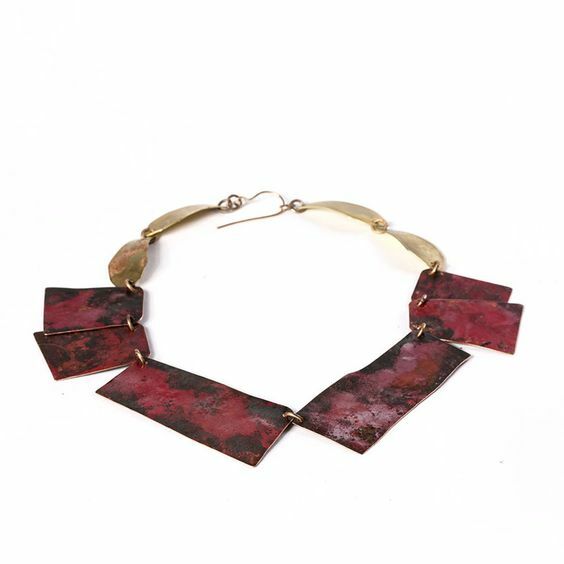 Still time to buy Roxy Lentz jewelry at KMAC for Christmas. A collection that will be at KMAC the next three months (20 sept. to Xmas 2017) , at 715 W Main ST, Louisville KY. The Kentucky Museum of Art and Craft is the premier spot in Louisville for cutting edge art. 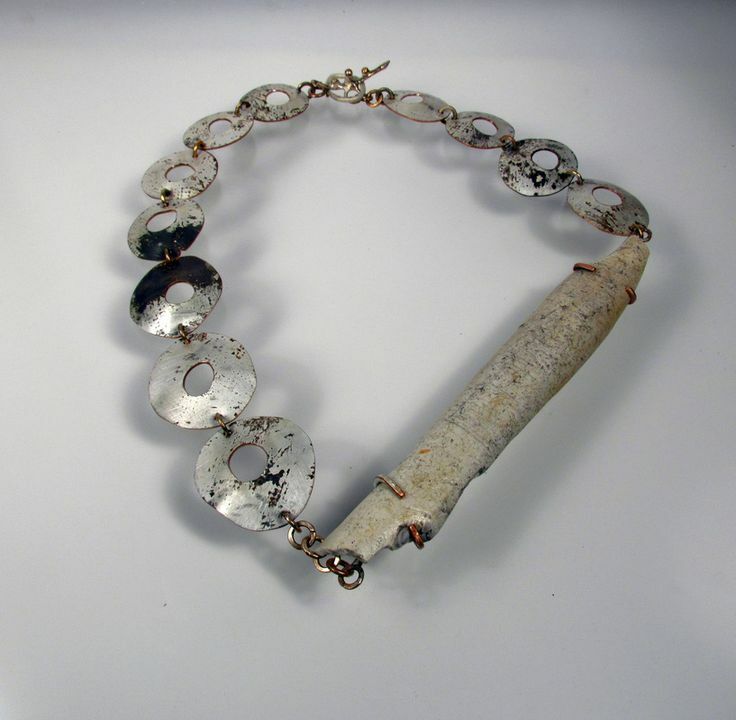 Roxy Lentz Jewelry at KMAC 2017 – neckpiece « back » - Necklace: Untitled, 2017 - Repurposed silver plate metal tray. DISCOVER MORE about Roxy Lentz & her jewelry through the Klimt02 interview ! « The majority of my jewelry is fabricated with repurposed metals. I love the patina of metal that has had a former life, the owner decided it no longer had value, and I make it into wearable art. A chain necklace that will be at Art in Speed Park, Sellersburg in August. Made from the Roger’s silverplate tray. For more information, please contact Julie Schweitzer at julie@artseed.art or 502-649-3320. EXCHANGE-BIJOU 1 – Roxy Lentz …… at JOYA ???? HOPE SO ! will we have the pleasure to see her jewels & meet her at the next JOYA Barcelona 2017 ??? SUSPENS !!!!!!!!!!!!!!! keep our fingers crossed !!! 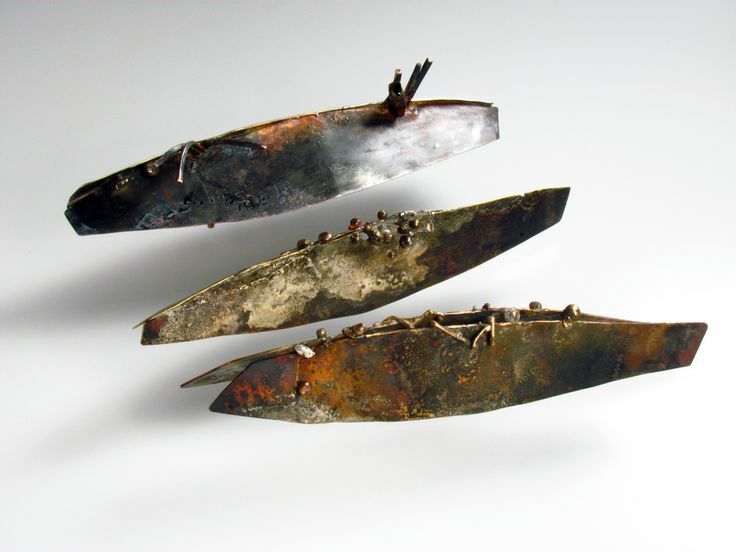 Roxy Lentz – brooch 2017 - found rusty metal, found slate, and « cannibalized » back from another brooch. Roxy Lentz Jewelry – avril 2017- Cuff from re purposed silver plate tray, different view. 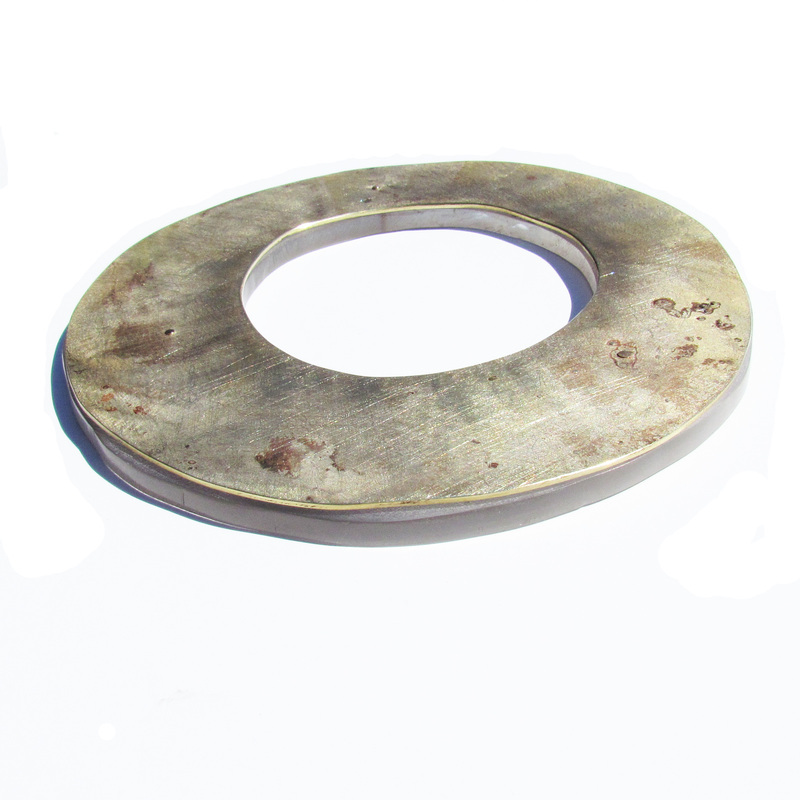 Roxy Lentz Jewelry· ring of re purposed silver plate, sterling band. 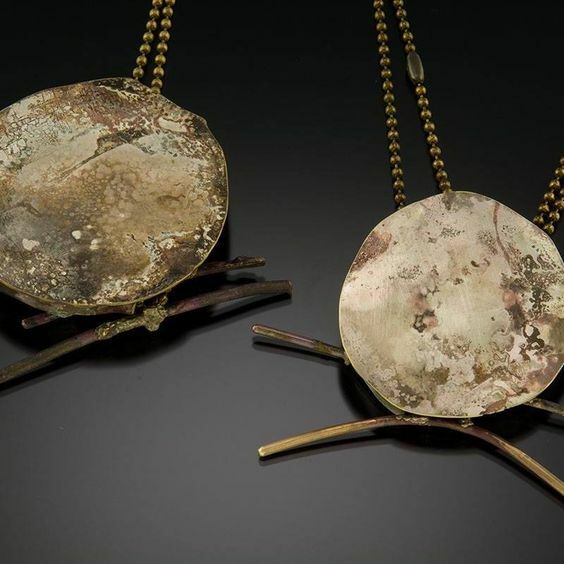 Roxy Lentz Jewelry – earrings - Re purposed silver plate tray. 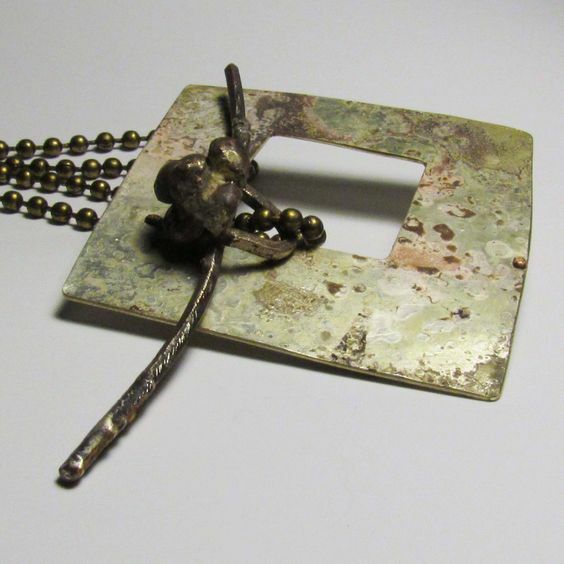 EXCHANGE-BIJOU 1 – Roxy Lentz – new works for spring …..
LOVE this WILD aspect of her jewelry !!! ………. 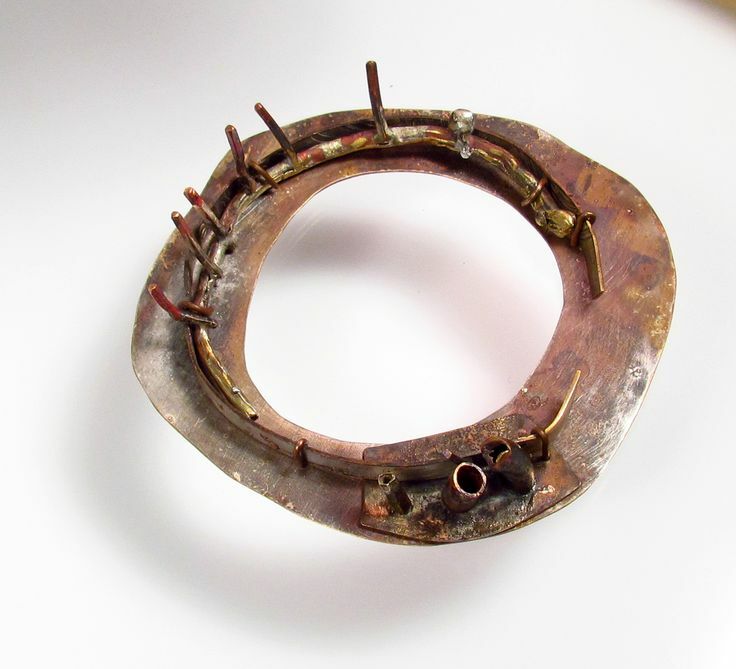 Roxy Lentz – bracelet of re-purposed metal – See the maker mark on the metal? It was on the back of the original silver plate tray. Roxy Lentz Jewelry- earrings process – A silver plate tray from the thrift store, you can see where I sawed out some earrings. The base metal is brass. 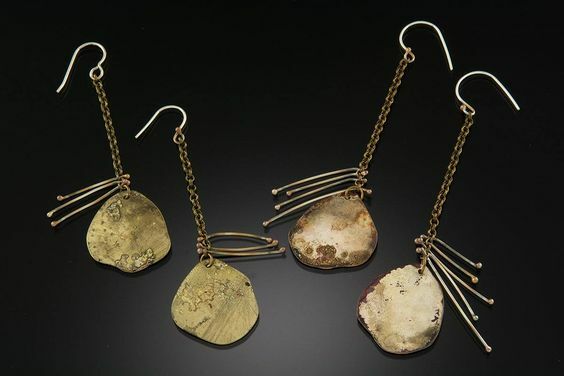 Roxy Lentz Jewelry – process – The earrings with the first fire patina. If I wanted to keep these just like this, I would have to use cold connections. But, for these earrings, I need to shape them and fuse the ends together, so, some of this will go. Roxy Lentz earrings – process – The finished earrings. I filed the edges, fused the ends with small bits of silver, and used a wire brush to put a sheen on the surface, and to remove the grime that happened when using the torch. Since I put the torch on the back side, I did preserve some of the beautiful « orange peel » on the front. Now, I could leave these like this, or take a chance and put them in a pickle pot to make them silvery. I like the patina, and I think my customers do too. That beautiful gold sheen on the right side of the right earring, it did it all on its own, that is why these are one of a kind, and uncommon jewelry for independent women. Roxy Lentz Jewelry the finished flower earrings. I used silver wire to cold connect the flowers to their base to preserve the patina. You can see that the base metal of this bowl was brass, because of the soft gleam on the edge of the flowers. After soldering on the post I put the brass base in pickle to clean the post, then I put it in a rinse of hydrogen peroxide and white vinegar to clean the fire scale off the brass. Some more buffing with a brass wire brush on the flex shaft. The earrings are about 2 1/2 inch long, and 1 1/2 wide. There are some similar at In Tandem Gallery and Gaia in Winston Salem NC. 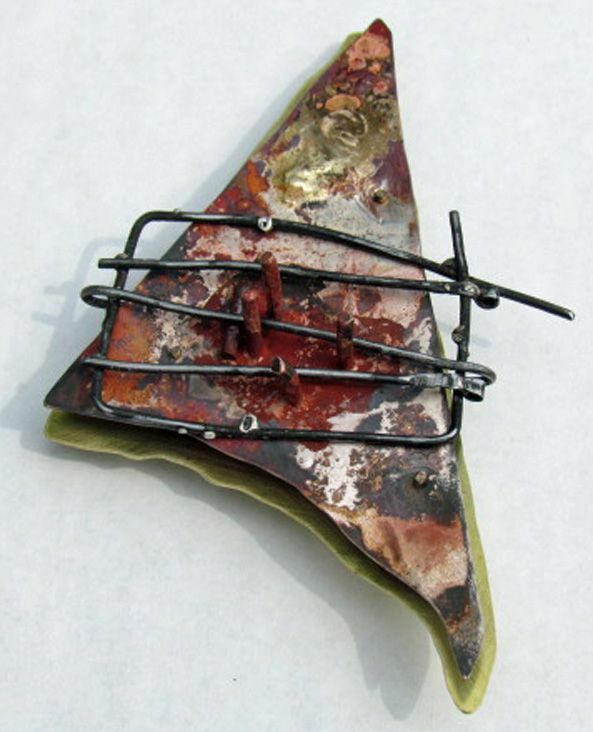 Roxy Lentz Jewelry · Pendant of re purposed silver plate and found pexi-glass. Available at In Tandem Gallery and Gaia in Winston Salem. One of a kind, so may not look like this one. Roxy Lentz Donut earrings of re purposed silver plate, with sterling hooks. One of a kind, so all are a bit different. EXCHANGE-BIJOU 1 – Roxy LENTZ – RED…y for Xmas ? «Uncommon jewelry for independent women» ! Roxy Lentz has just finished a show on Dec. 3, Quattra4 at Louisville, all for the benefit of a worthwhile charity. Gorgeous jewelry presented there ! 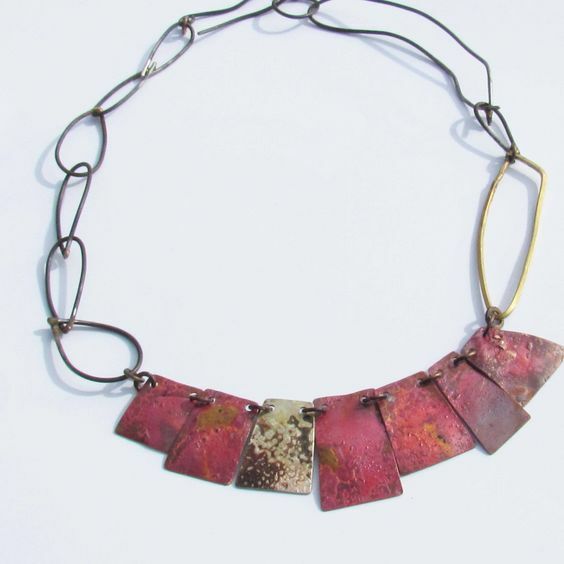 Roxy Lentz - Necklace of re-purposed silver plate metal, brass chain and rich wabi-sabi fire patina. Friday, Dec. 9: 12:00 p.m.–8:00 p.m.
Saturday, Dec. 10: 10:00 a.m.–6:00 p.m.
Sunday, Dec. 11: 10:00 a.m.–6:00 p.m.
« I fabricate contemporary art jewelry from re-purposed silver plate metal » she says. Not « I CREATE », but I « fabricate » …. In another place she tolds us « y jewelry is made from base metal, metal found at the thrift store. It has no real value, …. in « scrap »value it is about 10 dollars …. »WHAAAAT ????!!!!!! 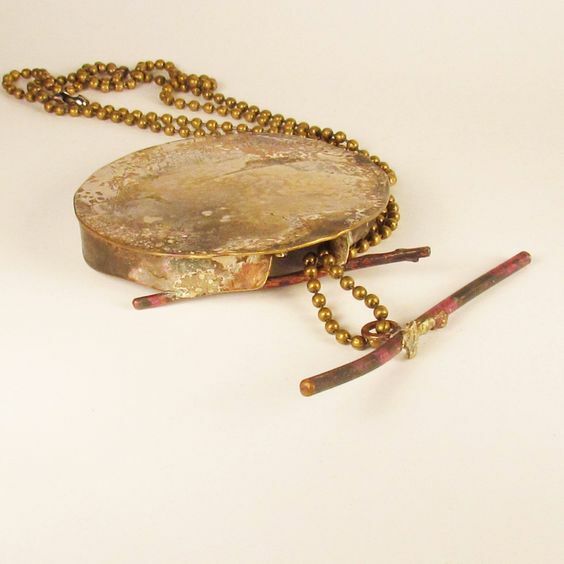 But in another place, I finally find this : « Uncommon jewelry for independent women » ! YES, it is THIS : jewelry with a character , jewelry with strength ! 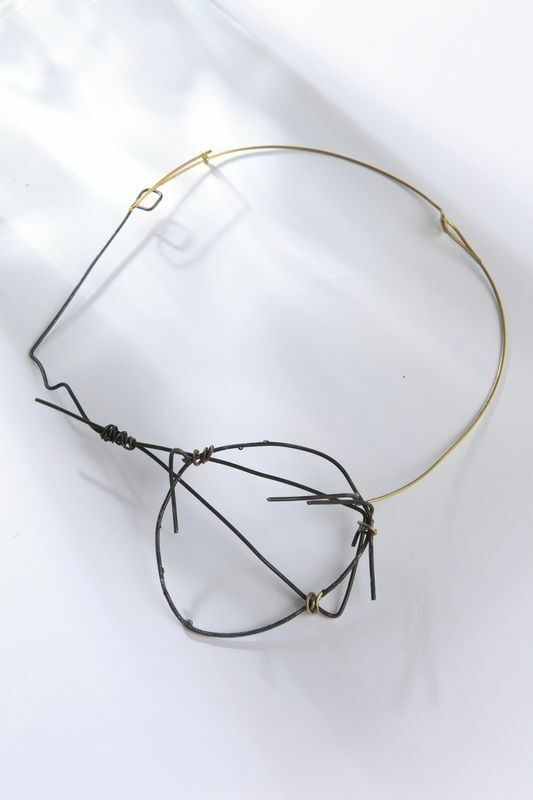 Yes, « wild », savage jewelry, rough, « rude », with suddenly a delicate detail, something to point out, where eyes focuses …. look at this bangle … it has a « savage » look, it is not perfectly squared, the round piece is not « perfectly » closed, the patina is irregular, and suddenly, a little detail that shows that, YES, someone brought attention to it :this little « goldy bouquet » on the left … do you see it ? this little detail brings EMOTION …. it is what we call in french « un supplément d’âme » (an « extra touch of soul« ), and it is why I LOVE so much the Roxy Lentz jewelry ! Each of her jewels has its little dosis of emotion ! 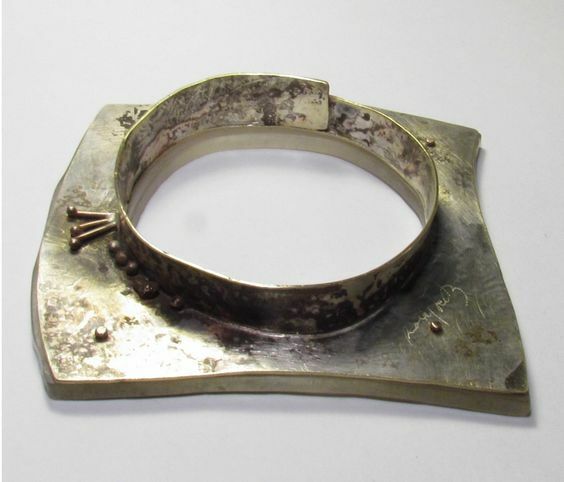 Roxy Lentz cuff of re purposed metals …. 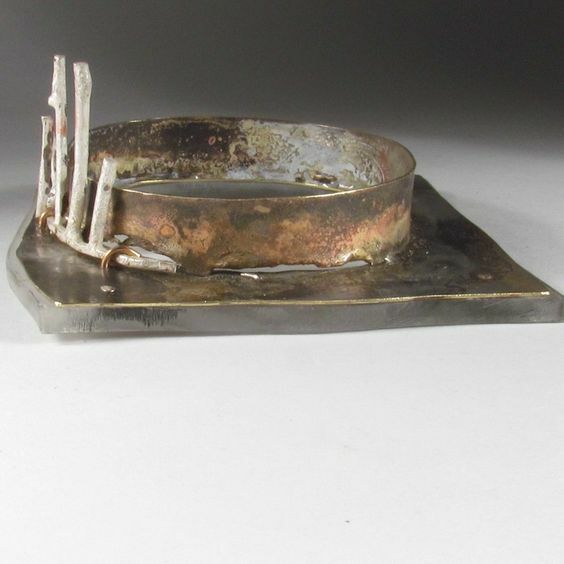 & EMOTION detail – re purposed silver plate with fire patina, riveted to found pexi-glass. Copper with melted silver riveted for added grunge and a bit of danger. These « irregular details » make her jewelry alive, unique, not two bangles can be the same ! Non non non, vous n’y êtes pas ! on n’est pas « au cinéma ce soir » avec « Il faut sauver le soldat Ryan », MAIS plutôt il faut « sauver » la créatrice de bijoux Roxy Lentz ! J’avais déjà remarqué, et donc aimé, certains de ses bijoux sur mon « board » Pinterest « ROUGH, RUDE & SAUVAGE … jewelry » mais en voici plus … rien qu’en son honneur ! 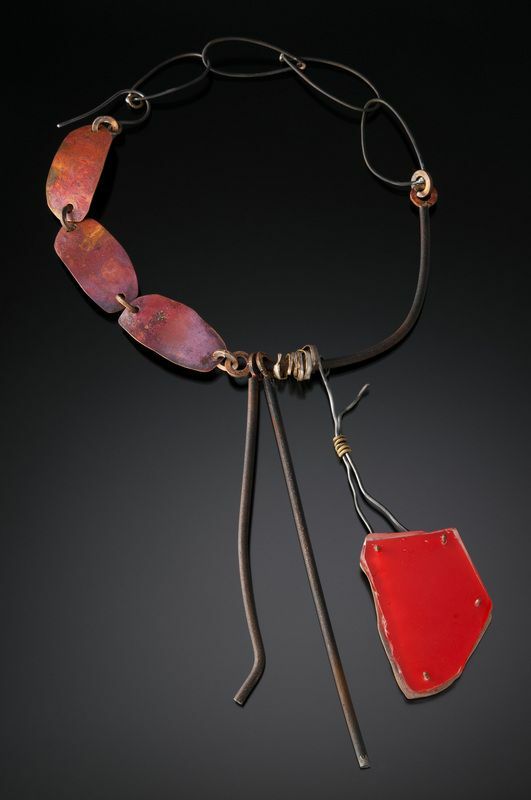 She calls her jewelry “uncommon jewelry for independent women” …..
Roxy Lentz – necklace – Copper, pexi glass, steel. 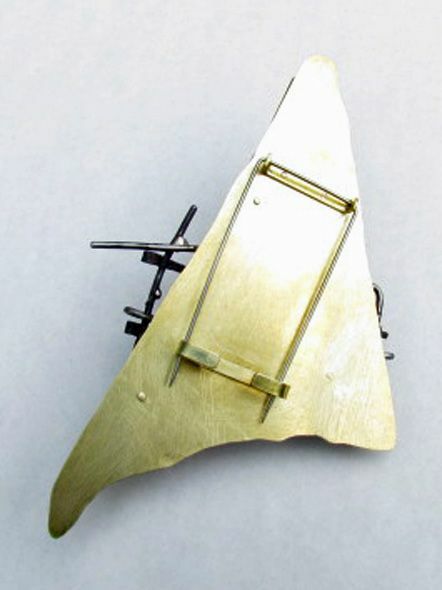 Roxy Lentz - « I found it on the ground » – Brooch, plexi-glass, nickel silver, brass, steel. The pexi-glass is from a fabric store sign that was blown down during a hurricane. Hurricane Ike took a side trip to the mid-west. 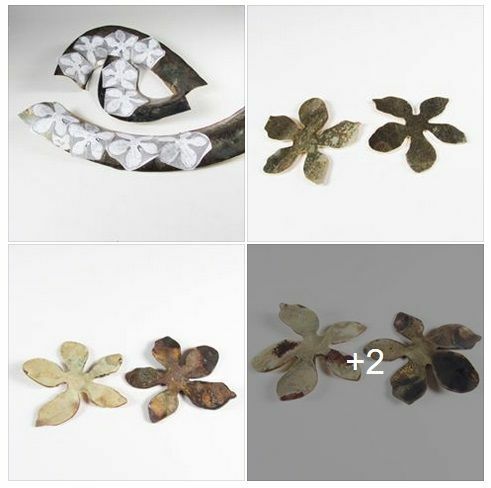 NFS – More brooches may be made in this material and style. about 3″ long. « I found it on the ground« The materials used for this jewelry have a past, and memories that go back to the beginning of time. Elements fused together and became metal, the metal was refined and fabricated into beautiful silver plated trays given as gifts for a new marriage, to someone who earned a bit of recognition, or just because. Then the memories change and are passed on to someone else, and the old memories are refashioned into new ones. A walk along a beach or river, will often find bits and pieces of burnt wood, things once recognizable and useful, now cast aside. Memories of a campfire, love, friendship, and good food. This collection is about the memories that fill our lives, we share, put away, then burn into our consciousness for safekeeping. 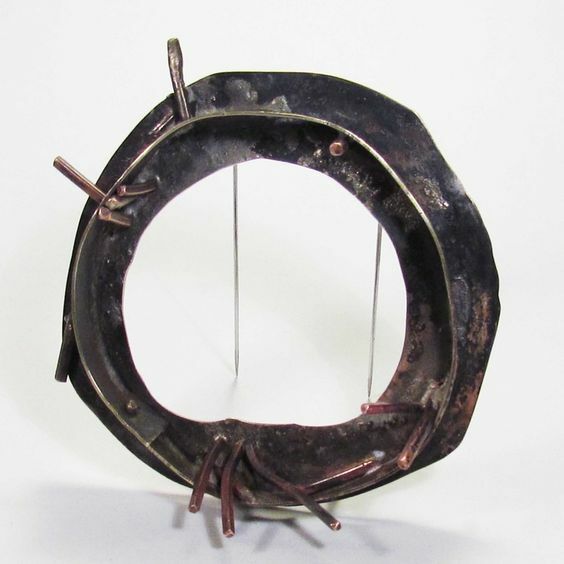 Artists’ reception Friday, March 1, 2013 from 6 to 8 p.m.
FERROUS, an exhibition of jewelry using iron, steel, and steel alloys. Although the use of iron dates back more than two thousand years, this humble material is more commonly used for agriculture and industrial purposes than adornment. A significant exception is the Berlin Iron Jewelry of the early 19th century. 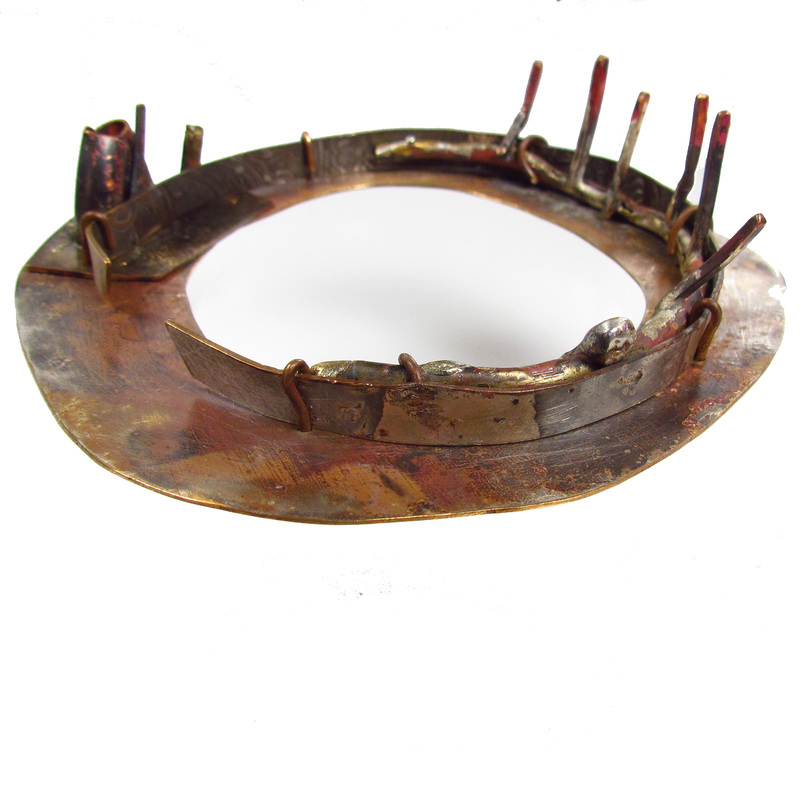 The Prussian Royal family funded the uprising against Napoleon by encouraging wealthy citizens to exchange their precious gold and silver for intricately fabricated iron jewelry.Intricacy is just one aspect the 60 artists of FERROUS explore with this versatile material. Known for its strength and lightness, the steel and iron jewelry of FERROUS is both rusty and shiny, sheet and wire, bejeweled and modest. The exhibition will take place simultaneously at Velvet da Vinci Gallery in San Francisco and as a virtual exhibition at crafthaus online. In May FERROUS will travel to 18Karat Gallery in Toronto, Canada as part of The Society of North American Goldsmith’s annual conference.